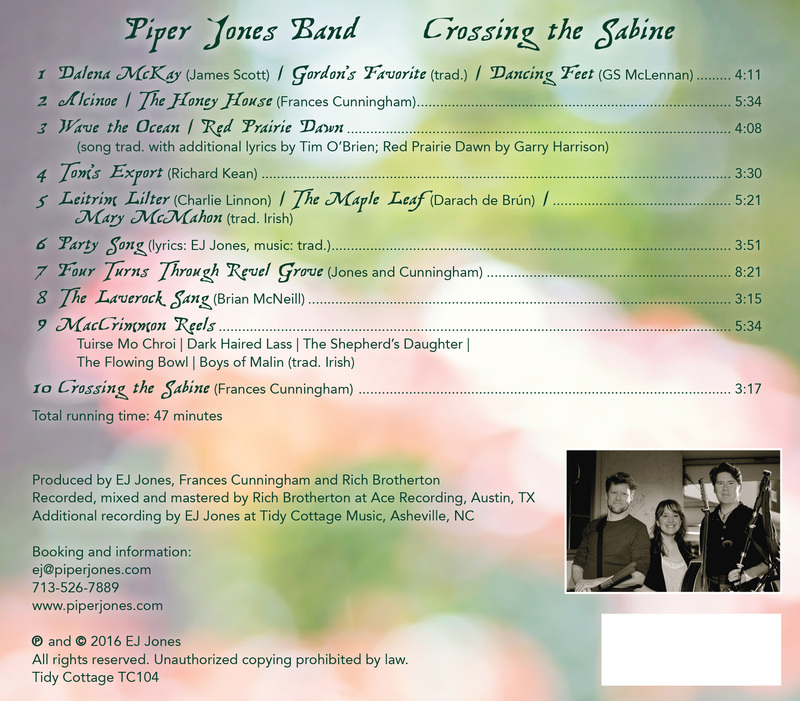 Here is the audio and print-packaging from the CD Crossing the Sabine. If you are looking at this you probably bought a copy (or several) and by doing so, made it possible for us to spend the $10K it took to make this first chapter. If you have found this link through a friend or by some other means, and haven’t bought a copy, please consider doing so or making a donation so we can recoup our expenses. Thanks!!! EJ: When Frances and I first started playing together, she called me up and sang this tune for me over the phone and I looked it up to find the name. She had found it on a Tannahill Weavers album and as I write this, I’m happy to say that I just caught the ‘Tannies in Asheville recently. They were a band where I first heard the pipes played with other instruments, purely for entertainment rather than competition. I think the feeling of hearing them for the first time as a young piper would have been as if you raised a boy in a family that was into competing at dog shows and then one day when he’s 16 the boy discovers that you can play fetch with one, forever changing his perception of what dogs can be. In my mind, this is the inaugural tune between Frances and me. The second tune is a traditional Irish tune that was played a lot by Gordon Duncan but I could never find the name of it so for now I’m calling it by this name. He had some of the best arrangements of Irish tunes. Dancing Feet was written in the early 20th century by a military piper, GS MacLennan, considered one of the foremost players and pipe music composers of the 20th century. A great early Tannahill Weavers album was also named after this tune. 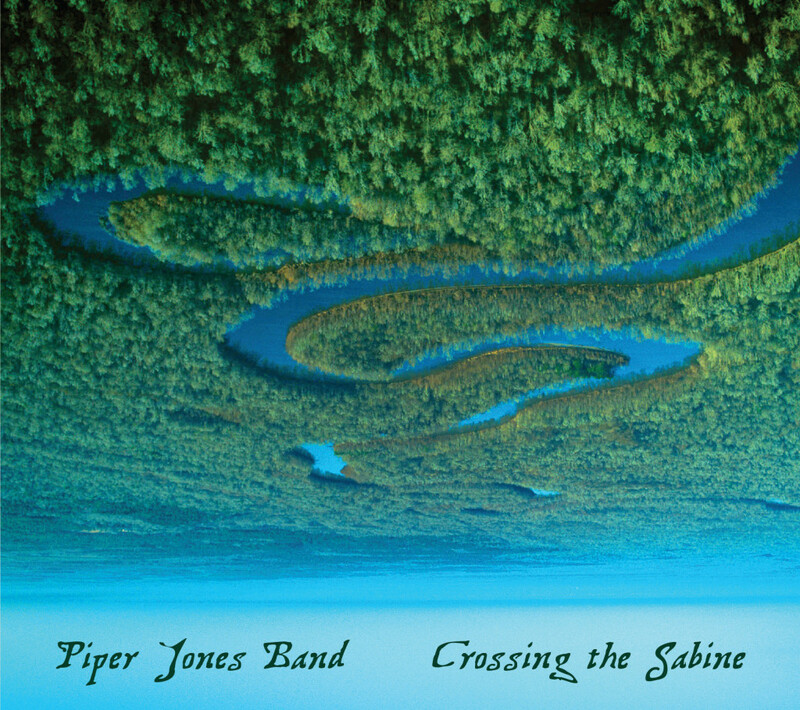 The Maryland Renaissance Festival has been a source of inspiration over the last few years for the Piper Jones Band, and a handful of tunes on this album exist because of it. I wrote the Honey House for a wonderful family who have allowed us to stay in their gorgeous house by a lake for the last couple of years on festival weekends. There’s a fox who stops by occasionally, morning coffee overlooking the misty water and people on boats looking for crabs (I guess that’s what they are doing—it is Maryland after all!) and to top it all off we’ve even gotten to taste the delicious honey out of their bee hives… Pure heaven!! Frances: When I moved to Tennessee I bought an old red pickup truck and had been driving it awhile when one day I reached under the driver’s seat and found an unmarked cassette mix tape. Whoever left it there had great taste! This song leaped out at me, and fortunately was pretty easy to track down since Tim and Mollie O’Briens’ voices are unmistakable. I changed the melody just a bit because it seemed pretty- the folk process in action. The words in the chorus are square dance calls. Red Prairie Dawn is a gorgeous tune written by fiddler/composer Garry Harrison, a giant in the Old Time scene who passed away recently, way too young. When planning this recording we had said that we would keep things pretty much how we do them live… but when you have a studio full of instruments it’s hard not to use them and so this one turned into a party at the end. EJ: One year at the Texas Scottish Festival, Richard Kean and I were the only two pipers in the Friday night “Kitchen” piping contest. Kitchen piping is playing informally to entertain the audience without worrying about correctness or purity of technique. I call it “Stage-piping” or “Informal Piping” but anyway in this case the contest was set up to be judged by members of the audience and a judge from the entertainment lineup at the festival. At the time Richard and I were in a band together and we’d had a gig a few weeks before. I had been practicing for this contest and when I saw Richard pull his pipes out of the box I saw that the fittings were really loose, meaning he probably hadn’t played since our last gig. I thought, “Well, I’ve got this in the bag,” and sure enough when I went up to play, all my practice was evident in how fast and clear my gracenotes were and how beautifully I knocked through a set of reels. I was a little smug when I passed Richard on my way off the stage and saw him trying to keep his instrument from falling apart. He got up and it was a little embarrassing because he was having a bit of trouble keeping the instrument in tune at first. I shook my head a little and thought, “Richard you should really be practicing more,” as I heard him stumble through a tune. Then I saw a look of resignation in his face and also, a realization: he now had nothing left to lose. Richard has always seemed to me an artist with his own inner voice looking for things to do differently than he’s told. As soon as he realized the contest was lost, he let the artist take over, and like a long-oppressed prisoner, it came bursting out, defiantly and proudly, and his playing changed. He started playing his own tunes and by the time he got to this one, everyone in the audience was rapt in the rhythm of it. He won the contest in spite of not practicing, by sheer display of his life-force in the tunes. I’m sure he made up this tune on the spot, at that contest, just to spite me. I’ve been playing it ever since. EJ: Rosie Shipley taught me the first tune at her family’s house in Nova Scotia, on the night I met her after a Clandestine show in Liverpool NS. Her mother Jane had suggested Rosie invite the band over the the house and I was the only one who went for it. Rosie and I later worked together with Gerry O’Beirne on The Willow in 2002 and had a band together briefly. That night turned out to be momentous for me and it’s one of the only times I’ve been able to learn a tune by ear on the spot. Having the brilliant Rosie Shipley in front of me must have been the right incentive! In the ’90s I was less of a flute player than I am now and went searching through O’Neil’s 1001 Irish Tunes to find something I could play on the Highland pipes. I found Mary McMahon in one of the only instances in which I could learn a tune from a book. EJ: A friend of mine has a daughter who, when she was planning her 7th birthday, set some rules for the ultimate party: 1) everyone wears their fanciest clothes, but no “ninja” clothes, 2) everyone will have sparkles and if you don’t have sparkles we’ll give you some sparkles, and 3) everyone gets to bring their pets. To me that sounded like the makings of an awesome party and I wrote the words for this song as if the party were actually Vahalla as understood by a 6-7 year old girl who had now grown into adulthood and the rules held. EJ: Revel Grove aka the Maryland Renaissance Festival is a perfect place to introduce the pipes and traditional music to a general audience. I’ve always wanted to capture the spirit I saw in my first Faire back in the early ’90s when I played at one that for a while had a healthy budget to hire entertainment. They hired me as a solo and my group Clandestine, going back to 1991. 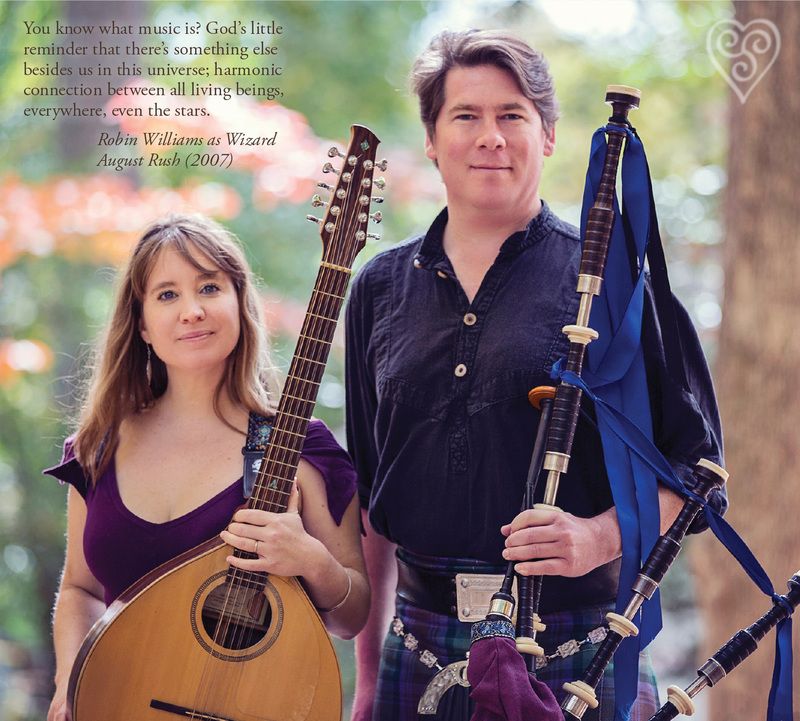 I remember when I saw piping at the Faire for the first time and I thought, “I could do this!” Later in the year I found Lars Sloan who had the piping contract there and told him I wanted to play there with him every one of the seven weekends the following year. He had been having trouble getting other pipers out for every weekend so he took me up on that offer and when we got together to rehearse the next autumn, he proposed the band’s name: Clandestine. The festival had hired hundreds of actors to dress and speak in characters based on historical figures and every evening they came together to dance to the sound of the pipes, hundreds of people in beautiful clothes and dresses and costumes all dancing as their characters. Toward the end of the season they would be dancing in torchlight and the effect was jaw-dropping to me. To this day I try to bring out that spirit in my playing and when the band was hired last year to play an extended run at Revel Grove, 20 years later and thousands of miles distant, I imagined teaching a dance at our closing set. Frances and I got into a bit of a competition to see who could write the most beautiful, dancable tune, and each night of the festival in 2015 we would teach the dance to a crowd of mostly strangers. I call it “A Turn through Revel Grove” because the dance is called An Dro, translating literally as “A Turn” and Revel Grove being such a great environment for having a moment of spontaneous beauty. If that festival hadn’t hired us these tunes wouldn’t exist and we would be a very different band. EJ: I was informed by the composer when we started performing this tune that I was mispronouncing “Laverock.” I’m not supposed to pronounce the “er” but pronounce it more like “Lav’rock.” I probably pronounce it this way because it’s got a *&!#ing “er” in it, as well as having had a good friend in my teenaged pipe band days named Sandy Laverock, who played the tenor drum in the Hamilton Pipe Band and one night tried to cuddle me in his sleep when we were sharing a bed on a band trip. I know in his sleep he was actually trying to cuddle his wife because he murmured her name as he put his arm over me. I mangaged to get out an “Uhhh… Sandy?” which woke him and no more cuddling after that. EJ: The Boys of Malin was taught to me by Beanie O’Dell, the leader of the Asheville Irish music community. It’s almost playable on the pipes since it needs a G# and luckily I can false-finger one on the chanter and make a substitute E on the smallpipes. I teach it as a smallpipe tune for people who are looking for common Irish tunes that are uncommon in the Highland piping repertoire. I should have called these “The Altan Tunes” because I learned the first two (three except I changed the fourth one) from the legendary Irish band Altan. I bought their CD The Red Crow at Cactus Music on S. Shepherd in Houston after absconding with Jen Hamel from CMU in Pittsburgh to re-form Clandestine in 1994, again with Lars. We were looking for music to learn and be inspired by and Jen wasn’t as big a fan of the Tannahill Weavers as I was. She and I were both heavily influenced by Altan when we were starting Clandestine and she took one of their songs “Nobleman’s Wedding” as a piece to play with the band early on. I didn’t learn these tunes until many years later when I was looking for new sources of material, and they are such finger-twisters to play that I thought they would be a unique entry in my favorite international piping contest, the MacCrimmon (formerly MacAllan) Trophy, which I saw Gordon Duncan win in my first trip to the Festival Interceltique de Lorient in 1997. That festival changed my life forever and it was a dream to play there in 2014 as the USA representative with these tunes in the Irish segment. I put “Tuirse Mo Chroi” in front of it because it fits great on the Highland pipes, and is an uncommon tune. 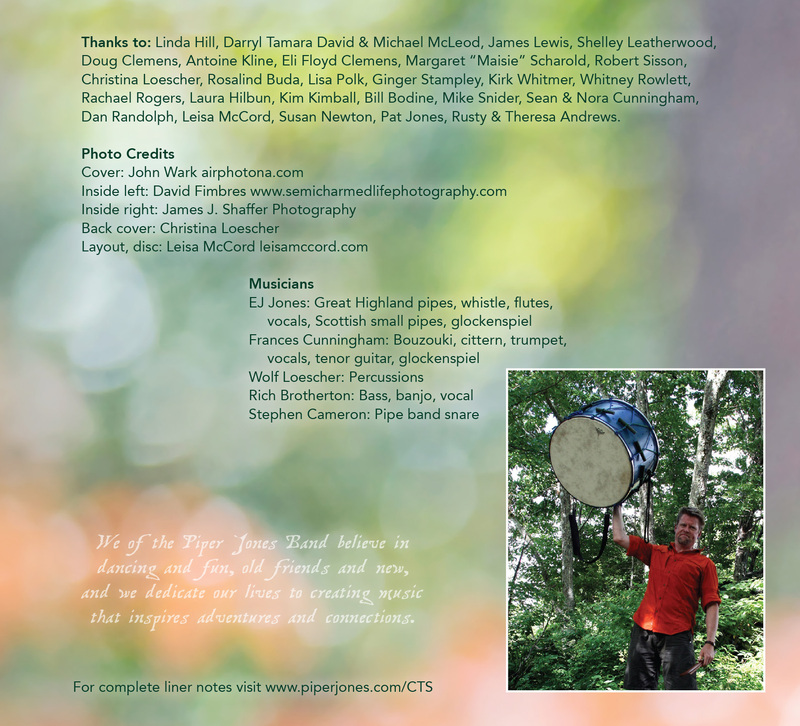 I can only find recordings of it by my flute-idol Barry Kerr and, you guessed it, Altan. Frances: EJ and I both grew up in Southeast Texas and Wolf lived there for many years as well, but we all three live in different states now. For me, crossing the Sabine River which is the border between East Texas and Louisiana is always emotional. It means I’m either leaving or returning to the place I love best; where my large, fun-loving, musical family still is, where the rice fields are intensely green and the Longhorns are regal and beautiful. The food tastes right (spicy!) and the air smells like the Gulf of Mexico. This tune came out of the emotional crossing back and forth over the years.